Believe it or not, New York City and its surrounding area is underrated. The Big Apple may deservedly be considered one of the most original, incredible, and important cities on Earth, perhaps even the cultural capital of the world. Yet, among all of the accolades, encomiums, and epithets heaped upon my hometown, the phrase “natural wonderland” is rarely heard. Take it from me, this urban wasteland boasts abundant natural delights if you know where to look. I do, which is why I absolutely HATE to visit without being able to hit my favorite haunts. Don’t get the wrong idea here; I love my family, the mother, siblings, in-laws, aunts, uncles, nieces, and cousins I’ve moved away from. Visiting them, or to be more specific, enabling them to visit with Mason and Ivy, is always my first priority. But I hate having to miss both friends and fauna, particularly aviafauna, when time is tight. That’s why I left my bins behind and carried only a point-and-click camera on my weekend blitz to New York and New Jersey. Highway birding favors bigger birds. Raptors like Red-tailed Hawks and Turkey Vultures predominate but the occasional Bald Eagle or Black Vulture really add excitement to a long stretch of highway. Pileated Woodpeckers and Belted Kingfishers are both conspicuous enough to identify as well as appreciate at 80 miles an hour. Of course, smaller species like Barn Swallow, Red-winged Blackbird, and American Goldfinch can’t be missed along New York highways in summer. My aunt and her family live in northern Westchester. She’s usually overrun with House Wrens but this year, the most notable denizens of her yard were mewling Gray Catbirds. For the first time, I got to take the ferry from North Bergen, NJ to midtown Manhattan. 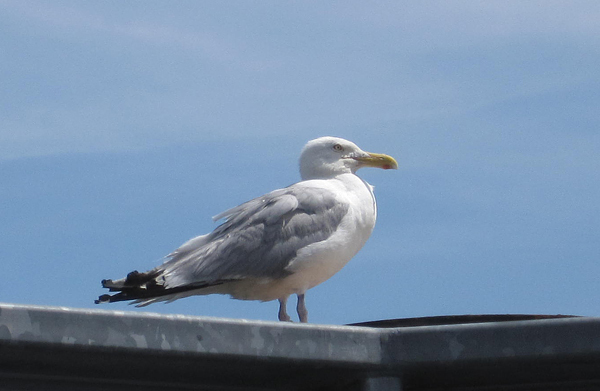 Herring Gulls and Common Terns loitered at the NJ terminal; I won’t describe the wildlife hanging around the NYC side. Even cooler, the route to the ferry brings one through Edgewater and more specifically past the Edgewater Community Garden. Unbeknownst to me, this is the home of one of the better-known NJ colonies of Monk Parakeets. Corey filled me in on that tidbit after the fact but I could tell as much from the raucous psittacine ruckus coming from the tiny greenspace. Even while discussing said parakeets with Corey over the phone while waiting for pizza, I spotted a tiny Downy Woodpecker pecking at a tiny tree in a ugly urban parking lot. Pave what you will but life will out, even in New Jersey! No Black Vultures for me on my trip through the Empire State to NYC and back in May 2005. I was sad. I think they’re all Ptomekin birds – probably beanie babies, and Corey and BirdingDude move them around town to amuse and bemuse visitors. @Jochen: The number of Black Vultures has steadily increased in recent years…you would be much more likely to see them now. Jochen, your trip would have been a lot better, at least from a birding perspective, if you had contacted me first. I can’t do anything about the coffee – Starbucks is about as good as it gets for me. Mike, wasn’t 2005 in the ancient, cold, gray, and barren pre-blogging days? Well, next time I am in NY, I’d say you provide the birds while I bring along some decent coffee. Deal? Jochen, I started 10,000 Birds way back in August 2003, before bird blogging was cool. Anyway, you’ve got a deal! I became aware of “blogs” through Charlie and his “Charlie’s Bird Blog” shortly after he got started on it (when was that again?). Back then I found all of it pretty obscure and odd – I was naive and hope I’ll be forgiven. I still remember an email from him saying that he thought I was just about the only one reading it. Wow, I feel like someone who knew Brad Pitt from highschool or dated Meg Ryan before people in general even knew she existed. Glad about the deal we have! The local birders here in Greenwich Village keep a log of sightings in the quarter-acre churchyard garden across the street from my apartment. We’re at over 160 species so far. I’LL say new York City is underrated!